Divide and Rejoice – Why Are Western Intellectuals so Enamoured with the Idea of a Fragmented Iraq? 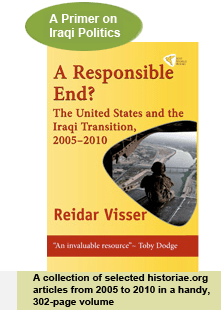 The main message in Peter Galbraith’s recently published The End of Iraq is that Iraq is a non-viable polity well on its way to predestined disintegration. US policy in Iraq, Galbraith maintains, should be adjusted accordingly. Galbraith is not the first author to write along such lines, but he may be one of the more important ones to do so. He has sympathizers in liberal and Democratic Party circles in the United States… Full story here. This entry was posted on Thursday, 17 August 2006 19:01 at 19:01	and is filed under Iraq and soft partition. You can follow any responses to this entry through the RSS 2.0 feed. Both comments and pings are currently closed.